I’m still trying to absorb the last week we’ve been in Pagosa Springs. I’ve started a blog post a few times, but am struggling with how to encapsulate the experience. It’s been a great one. But I’m not ready to share what I’ve learned since arriving last Wednesday. I’ll do that shortly. In the meantime, I thought I’d share some information about my recent phone service upgrade. This will probably benefit the vagabonds and travelers that stop by the blog … we’re the ones who typically rely on our phone for internet connectivity. If you live in one place, you probably have a broadband connection with unlimited data. That’s not the case for us travelers. From October 2015 until I made the switch last February, my data usage was increasing substantially. I was posting more video and still photos to the blog and to Facebook. Plus, we were in the tent a lot more because of bad weather and with nothing else to do, I was watching more Amazon Prime videos … and you probably know how data-intensive video is. My phone bill was exceeding $400 on a regular basis. Something had to give. I’ll bet I spent at least 80 solid hours of research (spaced out over several weeks) trying to find a solution. There are several services that advertise “unlimited data”, but it’s really false advertising. Either your data speeds are throttled to the point of unusability or there’s an actual limit in the small print that allows the company to suspend your service if you go over some usage point. In every case I investigated, I was already using more data than the small print limit. I found a solution almost by happenstance … about 10 pages deep into a Google search for “unlimited data phone service”. It was a link to a website for the Mobile Internet Aficionados group. They’re geared towards other folks like me who are living full time on the road (although I’m sure most of them are in big RVs). Remember those old Verizon lines that offered “true unlimited data”? They’ve long since gone away – Verizon no longer offers them, but they continue to honor the ones that are still in service. Not only that, the contracts on those old plans allowed for an “Assumption of Liability” (AOL) … the owners were free to transfer their lines to others. Based on that, there’s a pretty active secondary market for these unlimited data plans. You can find these “AOL” plans being offered for sale … and rent … on eBay. I looked today – the offer prices range from $650 up to $2,000 to buy one. They’re around $200/month to rent, but you should know – Verizon is doing everything they can to tighten up / eliminate these unlimited plans. They’ve added on some wait restrictions before transferring, they’ve upped the price, etc. Renting the plan means you’re at risk of losing the plan downstream if it’s not “yours”. MIA recommends a couple of vendors who offer a discount to MIA members. They also guarantee the transfer. Not only that, they will take care of every step of the transfer. They’ll find the seller. They’ll coordinate all the paperwork with Verizon and be on the phone with you during the transfer, after which you get a chip to put in your phone. So, I joined MIA for $59/year (as an aside, their monthly bulletin has some pretty good info on hardware, apps and other stuff to optimize your mobile internet functionality). I contacted a guy named Jason, one of those recommended vendors. He lists AOL plans on eBay for $2,000, but discounts it to $995 for MIA members. I was willing to pay a premium for the guarantee and the hand holding through the entire process. Jason was pretty cool, but a little scattered. I don’t know if there was some alignment of the planets or something, but I think he was suddenly inundated with a lot of business and was having trouble handling the extra business. At the same time, Verizon was announcing that changes to the AOL plans were imminent. As it turns out, I was able to purchase a line a couple of days before the changes were made (which would have delayed things by upwards of 60 days more). The Verizon line. It came with a 702 area code – some guy in Las Vegas was the original owner. I paid $995 to acquire it. Instead of adding the chip to my phone, I bought a personal wifi device – Verizon calls it “Mifi”. It can connect to upwards of 18 devices. Plus, it allowed me to keep my current phone number, which is still associated with the phone. The 702 line is associated with the Mifi box. Cost – $200. I could have picked one up for less on eBay, but decided to just pay full price and get it through Jason. I figure the additional dollars paid for the hand holding. I am so NOT a phone / hardware guy. Here’s where the benefit comes in – I’m now paying about $69/month for the unlimited data plan, including taxes and fees. I’m also paying $25/month for my cell phone. I dropped all data from the phone: I can connect it to the Mifi device to send photos and such. (And since the Mifi box is portable … about the size of a pack of cigarettes … I can leave it on in the car in case I stop to take a photo and upload it to Facebook or something). So, I’m now paying $94/month for what had been averaging about $410 over the previous 4 months. That’s a savings of $316 a month! That $1,250 I spent for the line, the Mifi box and the MIA subscription will be fully recovered with my May phone bill, and I’ll wind up saving over $2,700 over the first year of use! Not only that, I’ve been able to enjoy watching a few more movies and TV shows at night in the Nutshell. I can watch baseball. More Youtube videos. Whatever. Last month, I used over 125 GB of data. In the past, I had to restrict my usage. Not anymore. So that’s it. You need to calculate what your own usage is to see if this works for you. But if you’re like me – traveling around the country full time while bumping up against data usage limits – I’d highly recommend you join MIA and seriously consider buying one of these AOL plans. Feel free to send me a message (the form is on the About page) if you’d like any more information beyond what’s included here. My brother Andy just made a Facebook post to his daughter regarding almonds. You’ve read how almonds are good for you, right? I know I have! They’re rich in protein, vitamins and healthy fats. But do you remember the salmonella outbreak that was traced back to almonds in the early 2000’s? Well, thanks to an FDA ruling in 2007, a large percentage of almonds sold at your local grocer are being treated with propylene oxide (PPO) to eliminate future salmonella outbreaks. But is it a case of the cure potentially being worse than the disease? PPO is a chemical compound that has been linked to cancer in animal testing and was listed as a “potential occupational carcinogen” by the CDC in December of last year. It’s been banned by the NHRA as a fuel additive because of the threat it poses to guys in the pits. And yet PPO is being used to pasteurize a large percentage of the almonds sold commercially in the U.S.! The alternate pasteurization method authorized by the FDA is steaming the nuts to 200 degrees which, while still a better approach (from my perspective) than using PPO, breaks down some of the vitamins and oxidizes the fats. EatLocalGrown.com looks like it wants to become the Angie’s List for locally-grown food. According to their “How it Works” page, EatLocalGrown.com is a “tool that helps you find, rate and share locally grown food”. It’s zip-code based – you can search in a geographic area to find “farms, farmers’ markets, restaurants, grocery/co-ops and also all kinds of artisans like butchers and cheesemakers” (again, this is from their website). Now I’ve done my share of shopping at Farmers’ Markets in my day. It was an outing (without a closet being involved)! The San Jose Flea Market has a wonderful Farmers’ Market and I used to go there with my family quite a bit. And that got me to wondering whether it would be a good resource while I’m on the road. Sure enough, when I entered zip codes for the various places I’m staying, all of them had at least one and in many cases, quite a few places where you could buy locally-grown vegetables and meat. 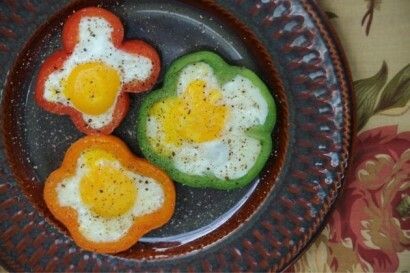 These “Flower Power Eggs” look good enough to eat! Oh yeah … that’s the point. So … I’ve added this website to the “Resources” directory on my browser … and you can be sure I’ll be using it a fair amount while I’m on the road. After all, it’s not like I’ll be buying a bunch of food at Costco when I’ll be living out of a cooler come June 1st! Driving an RV around the country (or “tenting” it like me)? Traveling with a trusty, four-legged navigator? If you’ve answered “yes” to any of the above questions, then take a look at some of the following links. You may just find something to help make your planning a little easier. I plan on updating the list as I get further along in my own journey (adding more state park lists, for example) and will let you know when that happens. Enter a location, select your interest (camping, hiking, rafting, etc. ), enter your dates and the website provides a number of options. Once you’ve decided, you can make online reservations. Sort of like hotels.com, except its for Federal land. It includes information from the National Park Service, BLM, Fish and Wildlife Service … a dozen Federal agencies in all. Make a selection on this interactive map and see what comes up. Choose a state and it will list all of the national parks, historic sites, seashores, recreation areas, etc. Purchase this pass and gain free access to any Federal land. They offer additional discounts to seniors (like me), the disabled and active military, including discounts on camping fees. There are a few states that also offer discounts if you have one of these passes. If you’re planning on visiting a number of parks in one year, it’s a really good deal! This is a good … albeit limited … resource when it comes to searching for a dog-friendly overnight stay. Enter your destination and travel dates and it will generate a list of hotels / motels with avaialability. HOWEVER, I’ve found that the rates aren’t all that great. I typically use this to identify places I can stay with Frank, but then head over to AARP.org to make my reservation. What it IS great for is finding restaurants that allow you to bring your dog along. Very cool! This is a great site for weeding out substandard campsites based on the experiences of your fellow campers! You can either search by state, or by a selectable radius around a particular location. You can specify the amenities, activities and atmosphere you’re looking for. (Or you can enter the name of a specific campsite and see what comes up). From there, you can choose from whatever campsites fit your requirements and see what other campers have experienced. For example: When I used this site, I would enter the area I was looking at and specify that I wanted sites that: allowed tent camping; were pet-friendly; offered electrical hookups and wifi; and were on a lake. This is another good site, but I found it was more geared towards RV’ers than tenters like me. I found Camping.com to be more user-friendly, but I’ll let you make your own choice. There’s very little that I DIDN’T buy off amazon. I don’t know how they do it, but they offer stuff at prices that are lower than what you can find by going direct to the source! I’d go to source sites (like those listed below) to find information, then check out the price over here … 99 times out of 100, I’d buy at Amazon. Need anything that’s outdoor-related? Odds are that Coleman’s made it! Here’s another site you can use for price comparisons. They offer a variety of brands (whereas Coleman only offers their own brand … obviously). Need your car fitted for a roof rack? Check this site out – you can enter your car’s make, model and year and it will search for products that fit your specific requirements. If you’re over 50, this group HAS to be at the top of your list! They’re a fantastic resource for anything travel-related! Lots of other good stuff for us old farts, too. If you’re on the road, these are a great group to have riding along! There’s a variety of road-protection services they offer. If you have another auto service, great! But I wouldn’t go on a long distance road trip without SOMEBODY looking out for me. I’m crazy, not stupid! This is a club geared towards RVers, but they offer some nice services for anyone considering a nomadic life. I’ve joined to take advantage of their mail forwarding service. But they have other benefits as well, including discounts on overnight camping.